With hundreds of complete systems, as well as individual machines, having been supplied to clients all over the world, Tenova TAKRAF is a key supplier of equipment and systems for open pit mining and bulk handling. The international company offers innovative technological solutions as well as process and commodity knowledge along various industry value chains. Recently,TAKRAF’s product portfolio has been enhanced with the addition of sizer equipment, which now enables the company to integrate its own crushing machines into complete mining solutions for its clients. 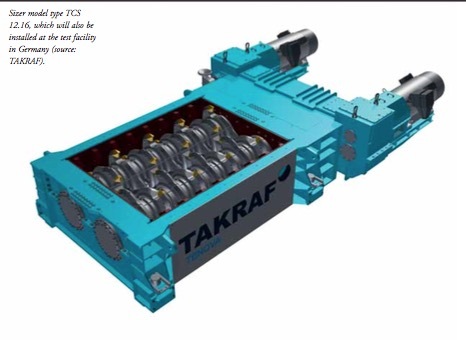 TAKRAF offers standardized primary and secondary sizers for various crushing applications. The primary sizer product range covers inlet sizes from 2.5m to 4m with a throughput of up to 10,000tph (tonnes per hour); whereas the secondary sizer range covers inlet sizes from 2m to 4m with a throughput of up to 3,500tph. Both sizer product ranges are suitable for the comminution of all material types, from standard to most challenging. A key differentiating factor of TAKRAF’s sizers is the fact that special focus and attention was directed towards attributes such as ease of maintenance, reduced downtime and long equipment service life already during the sizer’s initial development. As a result, this sizers offer unparalleled levels of maintenance efficiency and service life. Some of the innovative solutions adopted include the quick and easy changing of crushing segments, as well as the use of advanced wear-resistant materials such as hard-faced segments and tungsten picks. Other innovative solutions include an inching drive for roll maintenance, which increases safety significantly, a heavy duty drivetrain system; as well as adopting an efficient oil lubrication system with a view to greater environmental sustainability. Rock fragmentation and abrasion are critical elements with regards to material characterization. As a result,TAKRAF boasts in-house test facilities in Germany where it is able to conduct material tests across a wide variety of conditions. Determination of material crushability and wear behaviour can thus be analysed by specialized test machines, the results of which can then be employed to assist in sizer selection. Furthermore customized wear predictions of the crushing tools can also be determined. TAKRAF GmbH is a renowned supplier of equipment and systems for open cast mining, bulk material handling and the minerals industries. Headquartered in Leipzig, an additional engineering and production site is located in Lauchhammer. TAKRAF's product range includes planning, development, design and delivery of equipment and systems, including the manufacture of key components for open cast mining equipment and bulk handling systems in TAKRAF's own workshop.